Scorpions are nocturnal, predatory animals that feed on a wide range of invertebrates, such as insects, spiders, and even other scorpions. They are found on all continents except Antarctica. Australian scorpions can be found from the moist coasts all the way into the arid interior. Along the east coast of Queensland, scorpions are often found in and around people's houses. For unknown reasons, scorpions will glow brightly under ultraviolet light. This makes it very easy for scientists to collect scorpions at night - they just look for the bright green animal when they wave an ultraviolet light around! Australian scorpions can give a painful sting, but they're not considered dangerous. 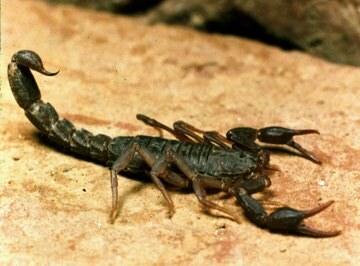 Some African and Middle Eastern scorpions are responsible for killing many people each year. If you get stung by a scorpion, apply an ice pack to try to reduce the pain and swelling. If the pain continues, seek medical attention. Scorpions make great pest controllers around the home, keeping the cockroaches under control. If you find one in your house (they often come up through drain pipes), encourage it into a plastic container and take it outside. Scorpions are nocturnal, predatory animals that feed on a wide range of invertebrates, such as insects, spiders, and even other scorpions. Australian scorpions can be found from the moist coasts all the way into the arid interior. For unknown reasons, scorpions glow brightly under ultraviolet light. This makes it very easy for scientists to collect scorpions at night - they just look for the bright green animal when they wave an ultraviolet light around! Australian scorpions can give a painful sting, but they're not deadly. Some African and Middle Eastern scorpions are responsible for killing many people each year. Scorpions make great pest controllers around the home, keeping the cockroaches at bay. If you find one in your house, encourage it into a plastic container and take it outside.